Great Steel & Metals strives to provide customers with a variety of checker plate products which can be used in residential elevator, stairways for security. We supply all types of checker plate, such as plate floor diamond, embossed tread plate, non-slip stair treads and checker plate flooring. These checker plates are available in standard galvanized plate, aluminum plate or stainless steel plate materials. Our checker plate's thickness varies from 2 mm to 22 mm, length and width from 250 mm to 4000 mm. For example: 6 mm × 2400 × 1200, 5 mm ×2400 × 1200, 10 mm × 2400 × 1200 and 3 mm × 3600 × 1500. Other sizes are available upon request. With rough surface, weather-resistant and low-wear, checkered plates can be used as floor board, factory stair boards, deck board and car boards, horse trailers and truck cover, loading ramps, building storage system. Perforated checker plates are used for sorting and screening any material from sugar, sand and gravel. Expanded steel plate mesh is mainly used in buildings and construction. Hard steel alloy plate can be used in concrete casting project as anti drilling mesh. 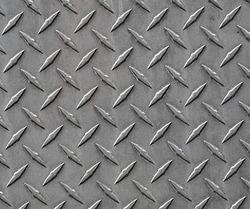 Diamond plate can be in steel, stainless steel, galvanized steel or aluminum sheets materials. You can choose the material suits you or you can contact us for suggestion while you can't make a definite decision. Hot dipped galvanized steel sheet, Z90, regular spangle, chromated, with thickness 0.7mm - 4.5mm. Diamond plate sheets made into a rear carrier for motor vehicles. 1m ×1m × 1.5mm aluminum steel diamond checkered plate with 22mm holes used for fish drying. 1762/1853/1986mm × 1200mm × 3mm aluminum sheets with holes powder coated colour standard white RAL 9003. How to polish aluminum diamond plate or restore the original shine? You can click here to learn how to achieve it. Checker plate, also known as chequer plate, diamond plate, tread plate and floor plate, is a type of lightweight metal stock with a regular pattern of raised diamonds or lines on one side. GREAT STEEL & METALS provide customers with a variety of checker plate products which can be used in residential elevator, stairways for security. We supply all types of checker plate, such as plate floor diamond, embossed tread plate, non-slip stair treads and checker plate flooring. These checker plates are available in standard galvanized plate, aluminum plate or stainless steel plate materials. Our checker plate's thickness varies from 2mm to 22mm, length and width from 250mm to 4000mm. For example: 6mm × 2400 × 1200, 5mm ×2400 × 1200, 10mm × 2400 × 1200 and 3mm × 3600 × 1500. Other sizes are available upon request. AISI 304 stainless steel checker plate in sheet size 1250mm × 2500mm × 3mm. Aluminium alloy tread plate roll with silver anodize finish, size 9100mm width, 5.6mm - 8.8mm thickness, 3600mm- 6400mm length. Aluminum expanded plate: A387 Gr 5; Coils; 0.5mm × 4' Width × 4m length. Galvanized checkered plates 1250mm × 2500mm × 5mm, 1500mm × 3000mm × 5mm, 1000mm × 2000mm × 5mm. 3m × 1.6m galvanized plate with 3mm to 4mm thick for horse trailer floor. 950mm × 600mm section diamond plate with 8 fixing holes, and 10mm fixing holes. Mild steel checker plate 1.225m × 2.5m × 5mm thick, 1.225m × 2.5m × 8mm thick. Mild steel checkered sheets 1.225m × 2.45m × 3mm thick, Galvanised. Blank mild steel plate hot rolled 1.225m × 2.45m × 4mm thick. 48" × 120" × 0.250" thick checker deck plate. Aluminium checker plate 1.225m × 2.5m × 8mm thick, 1.225m × 2.5m × 4.5mm thick. Stainless steel embossed checker plate with thickness 1mm to 5mm can be used for insulated box manufacture. Looking for Chequered Plate ?